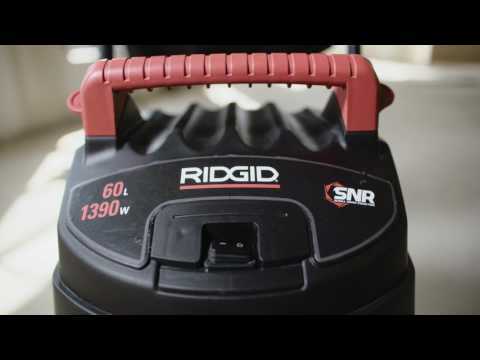 The RIDGID® Model WD1855AU is our 16-gallon MAX CAPACITY wet/dry vacuum. Our most powerful motor for the toughest cleanups is paired with a largest drum size. The large rear wheel help conquer tough terrain, and the cart design doubles as on-board accessory storage. The large capacity, rugged construction, and excellent mobility are ideal for anyone cleaning large, tough messes. Most Powerful 1,390W Motor - High performance wet/dry vacuum provides optimum power. 2-Piece Polypropylene Drum Construction - Rugged construction of durable material that resists kinks, tears, scratches, and dents. Our most durable drum available. Cart Design - The cart makes it easier to maneuver the vacuum and doubles as accessory storage. Accessory Storage - Enough storage on the vacuum to keep your accessories organized and close by for easy access. Large Rear Wheels - Provides increased maneuverability when moving the vacuum over uneven terrain. Cord-Wrap/Large Handle - Large carry handle provides an area for the storage of the 6m power cord. 60 Litre / 16 Gallon Drum - Cleans up large spills & messes at work-sites and busy shops. 64 mm x 2.1 m Dual-Flex® Tug-a-Long® Locking Hose - The ultra-flexible hose locks into your vacuum, so it won’t pull loose during use. The added Dual-Flex to each end of the hose allows it to bend up to 180º without losing airflow. 64 mm opening allows for more suction than smaller hoses. Large Drain - Located to lowest point of drum for emptying of water. Includes - Vacuum, owner's manual, 2 extension wands, 64 mm x 2.1 m Dual-Flex® Tug-a-Long® Locking Hose , utility nozzle, crevice tool, car/blowing nozzle, wet nozzle, Locking Blower Wand, muffler/diffuser, and fine dust filter.